If you follow us on social media, you might have gotten the impression that we have a mad love for Schnitzel. Allow me to correct you: we're a lot crazier for Schnitzel than you think! We're pretty certain that fried, breaded thin bits of meat were last invented somewhere between Italy and Austria, although it was probably invented in many places before. After all, it was a cracking way to make meat go further. Nowadays we don't really need to make meat go further, but Schnitzel is still awesome. It's actually quite quick, it's not that difficult to make, and it's fun! 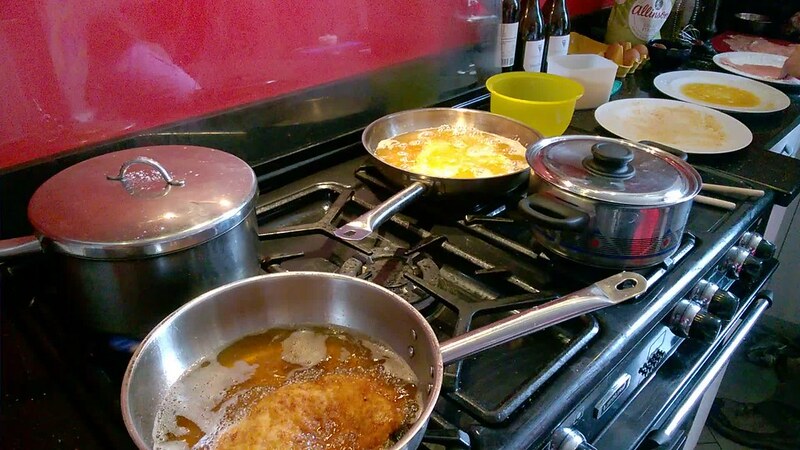 We're also aware that many people have never made Schnitzel, it looks hard, and first attempts can result in rather limp, irregularly cooked things that aren't all that pretty. But do try as even not-very-pretty ones are quite tasty. It's really hard to totally flop Schnitzel. Make your own breadcrumbs from dry bread. Use enough oil in the pan at a high enough temperature (it must swim). You need a nice solid meat hammer. When buying one look at weight, but also think about which one you'll be able to clean easily. Some are a nightmare. Warning: hammering meat has a very stirring effect on dogs (probably cats too). We have a stone counter and pound the meat on those thin flexible silicon sheet cutting boards, as we find this makes it easier to pick the meat up afterwards and to wash the silicone sheet in really hot water. Use chicken, turkey, pork or veal. The classic is veal. We usually buy pork chops, get rid of the bones and pound the meat. The really impressive ones, which you usually find in famous restaurants in Vienna, are the ones where the Schnitzel is bigger than the plate. In Germany, France and Italy, they don't quite go as bonkers on size as the Austrians. But in truth, neither do most of the Austrians. The Austrians are just as happy eating a pile of small schnitzels as one big one – and all sorts of thicknesses seem to be acceptable (including barely pounded deboned chicken wings. Just pound small pieces together – pound them flat separately, then pound them with some overlap to "mesh" them together. It works because the meat fibers get tangled. The only limit is the size of your pan! We make our own, saving the last slice/dried bits of bread. You'll need a decent blender. Big and deep enough to have a layer of oil in it, and heavy enough to keep temperature well. What to Drink with Schnitzel? Fresh aromatic whites - think Austrian Grüner Veltliner, Muskateller, Riesling, Pinot Blanc or Sauvignon Blanc. Try the Urban Muskateller, the Trie Weiss, the Diem Riesling, any of our Pinot Blanc, Buchegger's Grüner Veltliner and Waldschutz's Frühroter Veltliner. "Crunchy" reds - a juicy Blauburgunder, Blauer Portugieser, Dornfelder, a fresh Blaufränkisch like Trie Rot or Junge Lowen. Gamay as well, of course. Rosé - for me on of the best options. Try the Triebaumer Rosé if you don't want something too dry or the Waldschutz Rosé if you want it dry. Perhaps you would like to try the few bottles we still have of Dornfelder Rosé by Kollmann Lex.